Global events don’t just impact the cost of imported wine or cars. They can hit US stock and bond prices, gold and oil prices, and your mortgage rate. While most people don’t follow the economy closely, you probably should when you apply for a mortgage. When a terrorist takes over a metro in Europe, or a lunatic invades a country in Asia, investors worldwide scramble for safer places to put their money. The return is less important than just hanging onto what they have. US bonds, backed by the full faith and credit of our government, are still considered the safest investments in the world. Demand from foreign investors helps keep bond prices high and rates low. US homebuyers benefit from this. In this country, investors get spooked as well. And whether it’s an “interesting” Presidential tweet or a dotcom debacle, the unexpected often causes investors to move their money from scary stocks to benign bonds. In general, what’s bad for the economy is good for mortgage rates. 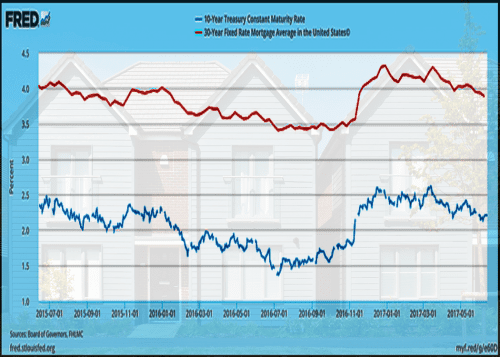 Do Treasury rates affect mortgage rates? Not really. But the things that drive the yields of Treasury Notes also drive mortgage rates. So they tend to move in the same direction but not always the same amount. US Treasuries and mortgage-backed securities (MBS) both respond to the global economy, and they do it in pretty much the same way. It’s just math. Mortgage rates almost always move in the same direction as Treasuries. However, MBS are riskier than government-backed bonds. Because of this, investors require higher interest rates for mortgages. This spread between Treasuries and MBS fluctuates, but typically runs between one and two percent. When demand for anything — oil, lettuce, fidget spinners — increases, prices go up. That means you get less oil, or lettuce or fidgets per dollar spent. Bond prices and yields work the same way. Treasury Notes, MBS and other bonds usually come in $1,000 denominations. If your $1,000 bond sells for exactly $1,000, this is called “par” pricing. If you buy a $1,000 note at par and it pays you $50 a year in interest, your yield (rate) is five percent. That’s $50 a year interest divided by the $1,000 purchase price = .05. Five percent today is a pretty good yield for a low-risk investment, because inflation has not been a concern. So lots of people will want to buy your bond, and its price will rise. Let’s say you sell it for $1,300. The buyer of your bond will receive the same $50 a year in interest. However, because she paid a premium for the bond, her rate (yield) is lower. She gets less product (interest) for what she spent. In fact, her yield (interest rate) is just 3.85 percent ($50 / $1,300). Suppose now that the Labor Department reports the US Unemployment Rate suddenly falls to four percent. That’s great for jobseekers and the economy, but it creates concerns. Labor shortages mean wages must rise, and rising costs lead to higher prices. Investors feeling optimistic sell their bonds and buy stocks. And those worried about inflation don’t think a bond paying $50 a year is so great. So bond prices fall until buyers can be found. If you sell your bond for just $800, the buyer gets that same $50 a year in interest. But, having paid just $800, he will get more interest income for the price paid. Take $50 interest and divide by the $800 purchase price, and you get a yield (rate) of 6.25 percent. Doesn’t the Fed raise and lower mortgage rates? Nope. You might hear that the Federal Reserve is “raising” or “lowering” interest rates. So, if the Fed raises rates by .25 percent, does that mean that mortgage rates go up .25 percent? Nope. When the Fed “raises” rates, what it alters is the Federal Funds rate – the rate that banks charge each other for overnight loans to cover their cash needs (every bank is required to keep a certain amount of funds, called reserves, with the Federal Reserve and these funds can be borrowed). However, the rate for these very short-term loans has little to do with rates for long-term loans like mortgages. 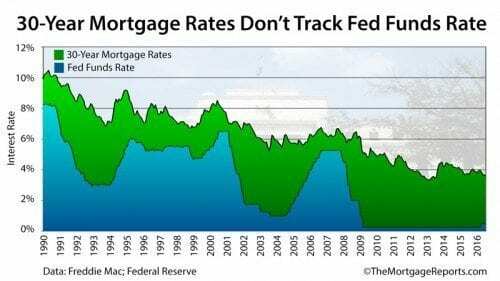 In fact, when the Fed “lowers” the Federal Funds rate, mortgage rates can increase. Lowering the Federal Funds rate effectively puts more cash into the economy. However, that extra cash competes for finite resources – for example, oil. More money competing for the same amount of oil drives prices up. That triggers inflation concerns, which make bonds unpopular, pushing their prices down and interest rates up. The graph below illustrates this. Controlling what you can — make sure you are as strong a borrower as you can be. Clean up your credit, because even a one point increase in your score, if it gets you into a better pricing tier, can save you thousands. Reduce your debt and come in with a better down payment if possible. Choosing a loan with a lower rate — if 30-year fixed rates are high, and you don’t plan to keep the house forever, explore hybrid ARMs. They’re fixed for three, five, seven or 10 years, and the rate can be up to 1.5 percent lower. Shop aggressively. Did you know that about half of mortgage borrowers take the first offer they get from a lender? Rates can vary between lenders by .25 percent to .5 percent. That’s a lot of money on the table if you’re not shopping around. Current mortgage rates are operating in a rather narrow range, and it’s a nice low range. By comparing multiple quotes from competing lenders, you’ll know if your deal is as good as it can be.